- Publisher This historic work reveals the inner spiritual life of one of the most beloved and important religious figures in history. During her lifelong service to the poorest of the poor, Mother Teresa became an icon of compassion to people of all religions; her extraordinary contributions to the care of the sick, the dying, and thousands of others nobody else was prepared to look after has been recognized and acclaimed throughout the world. Little is known, however, about her own spiritual heights or her struggles. This collection of her writing and reflections, almost all of which have never been made public before, sheds light on Mother Teresa's interior life in a way that reveals the depth and intensity of her holiness for the first time. Compiled and presented by Fr. Brian Kolodiejchuk, M.C., who knew Mother Teresa for twenty years and is the postulator for her cause for sainthood and director of the Mother Teresa Center, MOTHER TERESA brings together letters she wrote to her spiritual advisors over decades. A moving chronicle of her spiritual journeyincluding moments, indeed years, of utter desolationthese letters reveal the secrets she shared only with her closest confidants. She emerges as a classic mystic whose inner life burned with the fire of charity and whose heart was tested and purified by an intense trial of faith, a true dark night of the soul. Published to coincide with the tenth anniversary of her death, MOTHER TERESA is an intimate portrait of a woman whose life and work continue to be admired by millions of people. This historic work reveals the inner spiritual life of one of the most beloved and important religious figures in history. During her lifelong service to the poorest of the poor, Mother Teresa became an icon of compassion to people of all religions; her extraordinary contributions to the care of the sick, the dying, and thousands of others nobody else was prepared to look after has been recognized and acclaimed throughout the world. Little is known, however, about her own spiritual heights or her struggles. 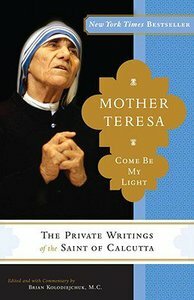 This collection of her writing and reflections, almost all of which have never been made public before, sheds light on Mother Teresa's interior life in a way that reveals the depth and intensity of her holiness for the first time. Compiled and presented by Fr. Brian Kolodiejchuk, M.C., who knew Mother Teresa for twenty years and is the postulator for her cause for sainthood and director of the Mother Teresa Center, MOTHER TERESA brings together letters she wrote to her spiritual advisors over decades. A moving chronicle of her spiritual journeyincluding moments, indeed years, of utter desolationthese letters reveal the secrets she shared only with her closest confidants. She emerges as a classic mystic whose inner life burned with the fire of charity and whose heart was tested and purified by an intense trial of faith, a true dark night of the soul. Published to coincide with the tenth anniversary of her death, MOTHER TERESA is an intimate portrait of a woman whose life and work continue to be admired by millions of people. Father Brian Kolodiejchuk, Ph.D., M.C., met Mother Teresa in 1977 and joined the Missionaries of Charity Fathers in 1984. I was only twelve years old then. It was then that I first knew I had a vocation to the poor ...in 1922. I wanted to be a missionary, I wanted to go out and give the life of Christ to the people in the missionary countries....At the beginning, between twelve and eighteen I didn’t want to become a nun. We were a very happy family. But when I was eighteen, I decided to leave my home and become a nun, and since then, this forty years, I’ve never doubted even for a second that I’ve done the right thing; it was the will of God. It was His choice. Reverend Mother Superior, Be so kind to hear my sincere desire. I want to join your Society, so that one day I may become a missionary sister, and work for Jesus who died for us all. I have completed the fifth class of high school; of languages I know Albanian, which is my mother tongue and Serbian*, I know a little French, English I do not know at all, but I hope in the good God that He will help me to learn the little I need and so I am beginning immediately these [days] to practice it. I don’t have any special conditions, I only want to be in the missions, and for everything else I surrender myself completely to the good God’s disposal. Sailing across the Mediterranean Sea, the zealous young mis­sionary wrote to her loved ones at home: “Pray for your missionary, that Jesus may help her to save as many immortal souls as possible from the darkness of unbelief.” Her hope to bring light to those in darkness would be fulfilled, but in a way she could not have antici­pated as she traveled to her chosen mission land. I’m leaving my dear house And my beloved land To steamy Bengal go I To a distant shore. I’m leaving my old friends Forsaking family and home My heart draws me onward To serve my Christ. Goodbye, O mother dear May God be with you all A Higher Power compels me Toward torrid India. The ship moves slowly ahead Cleaving the ocean waves, As my eyes take one last look At Europe’s dear shores. Bravely standing on the deck Joyful, peaceful of mien, Christ’s happy little one, His new bride­to­be. In her hand a cross of iron On which the Savior hangs, While her eager soul offers there Its painful sacrifice. “Oh God, accept this sacrifice As a sign of my love, Help, please, Thy creature To glorify Thy name! Fine and pure as summer dew Her soft warm tears begin to flow, Sealing and sanctifying now Her painful sacrifice. On January 6th, in the morning, we sailed from the sea to the river Ganges, also called the “Holy River.” Travelling by this route we could take a good look at our new homeland Bengal. The nature is marvellous. In some places there are beautiful small houses but for the rest, only huts lined up under the trees. Seeing all this we desired that we might, as soon as possible, enter among them. We came to know that here are very few Catholics. When our ship landed on the shore we sang in our souls the “Te Deum.” Our Indian sisters waited for us there, with whom, with indescribable happiness, we stepped for the first time on Bengal’s soil. In the convent chapel, we first thanked our dear Saviour for this great grace that He had so safely brought us to the goal for which we had been longing. Here we will remain one week and then we are leaving for Darjeeling, where we will remain during our novitiate. Pray much for us that we may be good and courageous missionaries. If you could know how happy I am, as Jesus’ little spouse. No one, not even those who are enjoying some happiness which in the world seems perfect, could I envy, because I am enjoying my complete happiness, even when I suffer something for my beloved Spouse. After nine years in Loreto, Sister Teresa was approaching a very im­portant moment in her life—she was about to make her profession of perpetual vows. Her superiors and her companions had by now become acquainted with her prayerfulness, compassion, charity, and zeal; they also appreciated her great sense of humor and natural tal­ent for organization and leadership. In all her endeavors she consis­tently showed unusual presence of mind, common sense, and courage, such as when she chased away a bull on the road in order to protect her girls and when she scared off thieves who broke into the convent one night. Dear Father in Jesus, Hearty thank you for your letter—I really did not expect it—I am sorry for not writing to you before. I just received the letter from Reverend Mother General where she gives me the permission to make my final vows. It will be on 24th May 1937. What a great grace! I really cannot thank God enough for all that He has done for me. His for all eternity! Now I rejoice with my whole heart that I have joyfully carried my cross with Jesus. There were sufferings—there were moments when my eyes were filled with tears—but thanks be to God for everything. Jesus and I have been friends up to now, pray that He may give me the grace of perseverance. This month I am starting my three months tertianship. There will be enough and plenty there [to offer] for Jesus and for souls—but I am so happy. Before crosses used to frighten me—I used to get goose bumps at the thought of suffering—but now I embrace suffering even before it actually comes, and like this Jesus and I live in love. Do not think that my spiritual life is strewn with roses—that is the flower which I hardly ever find on my way. Quite the contrary, I have more often as my companion “darkness.” And when the night becomes very thick—and it seems to me as if I will end up in hell—then I simply offer myself to Jesus. If He wants me to go there—I am ready—but only under the condition that it really makes Him happy. I need much grace, much of Christ’s strength to persevere in trust, in that blind love which leads only to Jesus Crucified. But I am happy—yes happier than ever. And I would not wish at any price to give up my sufferings. But do not, however, think that I am only suffering. Ah no— I am laughing more than I am suffering—so that some have concluded that I am Jesus’ spoiled bride, who lives with Jesus in Nazareth—far away from Calvary… Pray, pray much for me—I really need His love. I am sorry for chattering so much—but I myself do not know how [this happened]—Jesus surely wanted this—to make you pray a little more for your missionary. . . . Mama is writing very regularly—truly she is giving me the strength to suffer joyfully. My departure was indeed the beginning of her supernatural life. When she goes to Jesus, surely He will receive her with great joy. My brother and sister are still together—they are having a beautiful life together. You are surely very busy to think of letter writing. But one thing I beg of you: pray always for me. For that you do not need special time—because our work is our prayer. . . A few days ago I had a good laugh—when some incidents from Letnica came to my mind. Really, how proud I was then. I am not humble even now—but at least I desire to become—and humiliations are my sweetest sweets. . . . I must go—India is as scorching as is hell—but its souls are beautiful and precious because the Blood of Christ has bedewed them. I cordially greet you and beg for your blessing and prayers. This letter to her confessor back in Skopje is the first instance in her correspondence where Sister Teresa refers to “darkness.” It is diffi­cult to grasp precisely what “darkness” meant for her at this time, but in the future the term would come to signify profound interior suffering, lack of sensible consolation, spiritual dryness, an apparent absence of God from her life, and, at the same time, a painful long­ing for Him. Interior darkness is nothing new in the tradition of Catholic mysticism. In fact, it has been a common phenomenon among the numerous saints throughout Church history who have experienced what the Spanish Carmelite mystic St. John of the Cross termed the “dark night.” The spiritual master aptly employed this term to designate the painful purifications one undergoes before reaching union with God. They are accomplished in two phases: the “night of the senses” and the “night of the spirit.” In the first night one is freed from attachment to sensory satisfactions and drawn into the prayer of contemplation. While God communicates His light and love, the soul, imperfect as it is, is incapable of receiving them, and experiences them as darkness, pain, dryness, and emptiness. Al­though the emptiness and absence of God are only apparent, they are a great source of suffering. Yet, if this state is the “night of the senses” and not the result of mediocrity, laziness, or illness, one con­tinues performing one’s duties faithfully and generously, without despondency, self-concern, or emotional disturbance. Though con­solations are no longer felt, there is a notable longing for God, and an increase of love, humility, patience, and other virtues. Having passed through the first night, one may then be led by God into the “night of the spirit,” to be purged from the deepest roots of one’s imperfections. A state of extreme aridity accompanies this purification, and one feels rejected and abandoned by God. The experience can become so intense that one feels as if heading toward eternal perdition. It is even more excruciating because one wants only God and loves Him greatly but is unable to recognize one’s love for Him. The virtues of faith, hope, and charity are severely tried. Prayer is difficult, almost impossible; spiritual counsel practi­cally of no avail; and various exterior trials may add to this pain. By means of this painful purification, the disciple is led to total detach­ment from all created things and to a lofty degree of union with Christ, becoming a fit instrument in His hands and serving Him purely and disinterestedly. It is not surprising that Sister Teresa, already such an excep­tional soul, would be purified in the “crucible” of these mystical suf­ferings. Choosing to face this deep pain with trust, surrender, and unwavering desire to please God, while demonstrating an outstand­ing fidelity to her religious duties, she was already setting the pat­tern for her response to the even more demanding interior trial that was to come. Dear Father in Jesus, The Christmas feasts are approaching—by the time this letter reaches you—we all will be enjoying the joy of Baby Jesus. That is why I am sending you my heartfelt wishes. May dear God grant that you accomplish much for Him and for souls. Pray for the same also for your missionary. Surely you know that I have made my final vows. I was thinking also about you on that day; if you would know how happy I was that I could, of my own free will, ignite my own sacrifice. Now His and that for all eternity! You surely cannot imagine former Gond¯a, now as the spouse of Jesus. But He has been always so infinitely good towards me—as if He wanted to insure the possession of my heart for Himself. Once again, I sincerely thank you for all that you have done for me. Sister Gabriela is here. She works beautifully for Jesus—the most important is that she knows how to suffer and at the same time how to laugh. That is the most important—to suffer and to laugh. She is helping me a lot—in many ways—otherwise alone I would surely fail somewhere. She is ever ready to help me and I am so bad that I make use of her goodness. Sister Bernard is making her vows on 23rd January 1938. Thanks be to God now again everything is all right—Jesus has surely chosen her for something special, since He has given her so much suffering. And she is a real hero, bearing up everything courageously with a smile. . . . If we want Bengal for Christ we have to pay with many sacrifices.—Now I really rejoice when something does not go as I wish—because I see that He wants our trust—that is why in the loss let us praise God as if we have got everything. Maybe Mama has written to you. She is now with my brother. They are so happy. One thing only they are missing— and that is their Gond¯a. But thanks be to God that Mama again has the church nearby and that she can speak Albanian. How happy she is about it. My sister has become the prefect of the Sodality of Our Lady for the high school girls. I hope that she will do much for Jesus. Surely you want some news also about me. One thing, pray much for me—I need prayer now more than ever. I want to be only all for Jesus—truly and not only by name and dress. Many times this goes upside-down—so my most reverend “I” gets the most important place. Always the same proud Gond¯a. Only one thing is different—my love for Jesus—I would give everything, even life itself, for Him. It sounds nice but in reality it is not so easy. And just that I want, that it not be easy. Do you remember once you told me in Skopje: “Gond¯a, you want to drink the chalice to the last drop.” I do not know if at that time, I thought as I do now, but now yes, and that joyfully even without a tear. . . . It does not go so easily when a person has to be on one’s feet from morning till evening. But still, everything is for Jesus; so like that everything is beautiful, even though it is difficult. I am terribly sleepy this evening, so please forgive me for writing like this—but if I do not finish this evening, tomorrow will be too late. Please cordially greet Fr. Vizjak—today I have sent him some books. Since Mother Teresa longed for complete union with Christ, who suffered on the Cross, she—His little bride—could not do oth­erwise than be united to Him in His suffering. If she could not re­move His pain, then she would be there, on the Cross as it were, with Him. Choosing to share the lot of her Beloved, she welcomed the crosses that accompanied her constant self-giving. I think that Jesus loves Sister Teresa very much. We are in the same house. I notice that every day she tries to please Jesus in everything. She is very busy, but she does not spare herself. She is very humble. It cost her dearly to achieve that, but I think that God has chosen her for great things. Admittedly, her deeds are entirely simple, but the perfection with which she does them, is just what Jesus asks of us. To her friends back home in Skopje, she disclosed the prayer she whispered in her heart while returning to the convent: “O God, how easily I make them happy! Give me strength to be always the light of their lives and so lead them to You!”33 She could not imagine that less than a decade later her prayer would be answered: she would dedicate not just her free time, but her entire life to the poor, becom­ing a beacon for them through her love and compassion. Customer Reviews For "Mother Teresa"
Great read that takes you into the depths of the heart and soul of Mother Teresa. Provides a great insight into her journey and her personal struggles that not many people know about. Her personal handwritten letters are included which makes this book extra special ! Very encouraging and heart warming.